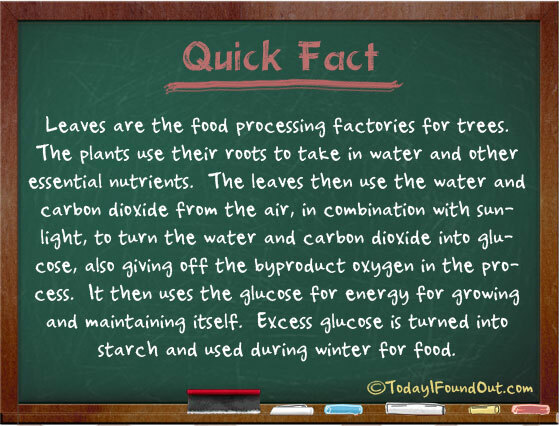 Leaves are the food processing factories for trees. The plants use their roots to take in water and other essential nutrients. The leaves then use the water and carbon dioxide from the air, in combination with sunlight, to turn the water and carbon dioxide into glucose, also giving off the byproduct oxygen in the process. It then uses the glucose for energy for growing and maintaining itself. Excess glucose is turned into starch and used during winter for food. I had no idea that the purpose of a tree’s leaves was to turn water and carbon dioxide into glucose. However, I find it even more interesting that excess glucose is converted into starch so that the tree can survive off of it during winter when most trees lose their leaves. How exactly is that starch stored, though, when the leaves fall off? I have always wondered about what the purpose of a tree’s leaves was and so I’m glad to finally find out that it is their food source. I always thought that a tree got its water from the ground and so it is interesting to find out that it gets it from the leaves too. However, how does the tree feed without its leaves in the fall and winter?